Go For It sprl (“We”) is strongly committed to protecting the privacy of your personal information, and this privacy statement explains how We treat your personal information when you use this site. By using this site and submitting any personal information, you agree to the use of such data in accordance with this privacy statement. We collect only personally identifiable information that is specifically and voluntarily provided by visitors to our website. In particular by submitting us your photograph, your school or affiliation and references on the services we provide, you authorize us to use and publish this personal information for advertising, promotional and commercial purposes such as but not limited to, in presentations, brochures, flyers, banners, newsletters We use to enhance our business, as well as on our website and our social media tools, such as but not limited to, LinkedIn, Facebook, Twitter, Instagram. We collect information from you when you register on our site, subscribe to a newsletter, fill out a form or publish on social media sites We own or enter information on our site. 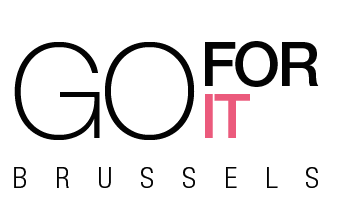 If a visitor believes the site has collected excessive information, we encourage the visitor to contact us at team@goforit.brussels to raise any concerns. When a visitor provides personal information to us, we use it for the purposes for which it was provided to us as stated at the point of collection (or as obvious from the context of collection). Examples of the types of use are given in the ‘Data collection’ section above. We may also use your data to contact you with information about our business, services and events, and other information which may be of interest to you. You may unsubscribe from our mailing list at any time by contacting us as set out in the ‘Unsubscribe’ section below or through the unsubscribe link in our communication to you. We may also use your information in order to administer and manage the site or communicate with you about the site. Our websites do not collect or compile personally identifying information for dissemination or sale to outside parties for consumer marketing purposes, or host mailings on behalf of third parties. If you would like to find out more about the different categories of information collected, please review the ‘Data collection’ section. The personal data you submit to us will only be retained for as long as is required for the purposes for which it was collected. Contact information about visitors such as mailing list information is kept until a user unsubscribes to a publication or requests that we delete that information. Resumes are disposed of when they are either no longer under consideration, or are considered dated by our Human Resources departments. Should visitors subsequently choose to unsubscribe from mailing lists or any registrations a visitor may contact team@goforit.brussels to request immediate unsubscribe.